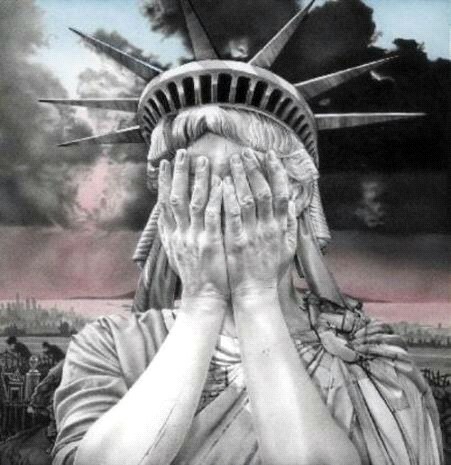 You are asking "How to make America great again": America remaining an unrepentant nation which has just lowered a plank of civility for the entire humanity! You don't know why, do you? Because right now America is closing its 2008-2016 period of usurpation of presidency by some UFO (Unidentified Foreign Operative) under alleged name Obama without peeping a word: On the contrary, still keeping a taboo on the words of truth; with the 1st amendment in place – but unused, and the 2nd amendment also in place – but not one shot fired for upholding the Constitution during all these ugly 8 years. Since the very beginning in 2008, according to his official bio, the UFO was not "born to citizen parents on the soil" – replicating the language of the "Law of Nation" and the 2008 Sen. Res. 511 on McCain. Moreover, in 2011 the UFO produced his "paint art" copy of the Birth Certificate, a kind of a 3 dollar bill, and used stolen social security number. In the modern time the humanity has not seen such an ugly spit into a face of justice, law, and order. No law – no civilization, and no greatness indeed! America now exemplified a defeat of civilization, getting in the same company with the former USSR, which indeed could not even dream to expose Stalin while the cannibal was alive. The USSR did partially expose Stalin in 1956, 3 years after the tyrant dropped dead. Now what: America must look up to the former Empire of Evil for a good example. Are you not ashamed!? Meanwhile President Trump seems surrounding himself with those very people guilty or silent during 2008-2016 usurpation, and he is still attached to the Republican party guilty in the triple 2008/2012/2016 treason, and collaborating with the impostor all those 8 years. They enthroned him in 2008, "re-elected" in 2012, and promoted 4 more impostors in 2016! In a civilized nation Republicans could only end up in the Big House rather than make majority in the House. Ban of open homosexuality and propaganda thereof, and so on (see the Platform under http://JudeoChristianAmerica.org/Platform.htm ).